I'm so excited about all the surprises I have in store for my readers! Be sure to stop in and check out the special guest posts (Mondays) and giveaways (Wednesdays) during the month of May. 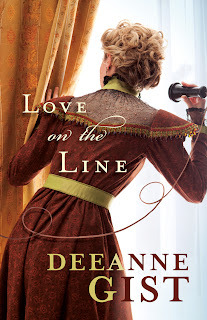 We're kicking off the celebration of Christian Writer/Reader Connection's 4th Blogoversary with a giveaway of Love on the Line by Deeanne Gist. 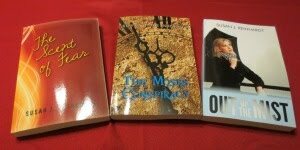 Have you read any of Deeanne's books? Which one is your favorite? 5) Contest deadline: Saturday, May 5, 2012, at midnight. The winner will be notified by email. If you do not leave me an email in the comments and do not respond to the Winner Announcement on the blog by Saturday, May 12, 2012, another winner will be selected from the entries. I love Deeanne Gist! She is one of the few comtemporary authors I list amongst my favorites. I can't figure out how to share this on my phone, but as soon as I get to a computer tonight I'll post it to FB. OK. You've got two entries. I am a HUGE fan of Deeanne Gist!! What a wonderful giveaway! I have also shared this on facebook, Thank You!! I forgot to mention that I am now a follower - Yay! Welcome, and thanks for becoming a Follower! I hope you'll visit often. We've got lots of giveaways this month. Thank you for sharing this, Susan. I didn't know about Deeanne and am always happy to learn about another Christian author! I'm following your blog. Thank you for becoming a Follower here and entering the drawing! I post Monday, Wednesday, and Friday. This month, we have many giveaways. Ah, Dottie, so sorry you can't enter! I hope you'll enjoy the guest posts this month.